Your kindergartners are improving with each book they complete in the Abeka Basic Phonics Readers. 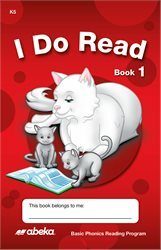 Now that they have completed the I Learn to Read series, they are ready for the I Do Read series. This 15-page colorful reader will encourage them to keep doing their best as they practice reading little stories with one- and two-vowel words. Noting punctuation helps them to read more smoothly and with more expression. You should notice that your students are no longer sounding out each syllable of a word in order to read. They know how to read words in sentences now! Once they complete Book 1, have them take it home to read to family and friends before moving on to Book 2! Included on the back of this paper book are spaces for parents to sign, indicating their child has read aloud the homework pages. Suitable for groups 1–3, all levels of beginning readers. 10/pkg. K5.